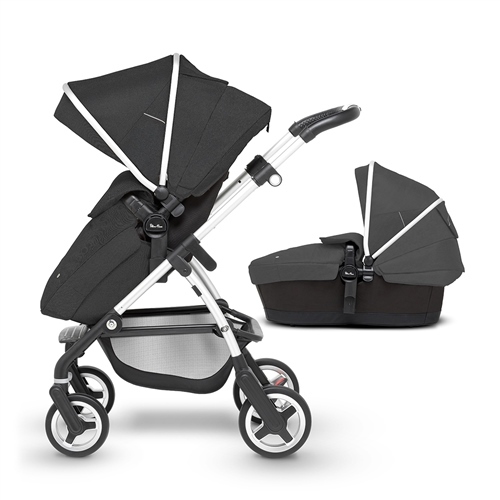 The Silver Cross Wayfarer is a lightweight and compact contemporary pram and pushchair combination. It’s a true three-in-one with a separate carrycot and seat unit supplied as standard. Suitable from birth, use the included carrycot to create a lie flat pram for your newborn. When used separate to the chassis, the carrycot is also suitable for overnight sleeping too. Switch to the seat unit and it can be a forward or rear facing multi-position pushchair from when your baby is able to sit upright. With or without the seat unit fitted, the Wayfarer features a brilliant one-piece fold; compact enough for transporting or easy storage. Add the optional Silver Cross Simplicity car seat and it becomes a complete travel system. Flexible, functional and fun, the Wayfarer is the perfect mix of practicality and style. The Wayfarer comes with a cleverly designed hood and apron pack that fits both pram and carrycot, so it’s always easy to update your look. The included apron features a newly improved design with additional Velcro fastening for a more secure fitting. We are over the moon with this pram,baby isn't here yet,but we had a play,it's so easy to swap from the carry cot to the car seat and pushchair,and also to fold,which is good especially if weather is bad,don't want to be fiddling trying yo fold it up. Great pram & arrived within days great service thanks !